For diabetics, the daily process of monitoring and responding to changes in blood-sugar levels can be an onerous task. 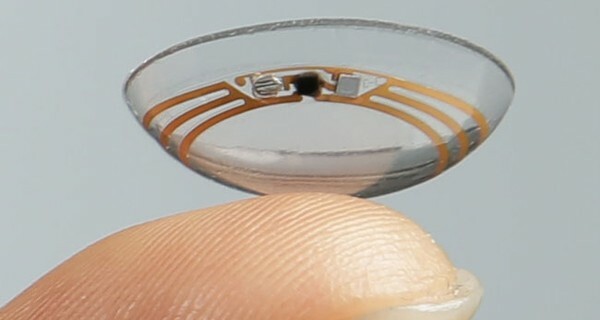 These contact lenses, able to take glucose readings once a second from your tears, present the exciting prospect of replacing finger-prick tests or current continuous monitoring systems, which require the user to have a device attached to their blood stream. Developed by Brian Otis and Babak Parvis, electrical engineers working at the University of Washington and then as part of the Google X Lab, the technology involved is impressive. Incorporating a miniaturised glucose sensor and a wireless antenna thinner than a human hair, each lens draws in and analyses tiny amounts of tear fluid through a tiny pinhole in its surface. Initially announced in January 2014, Google finalised an agreement in July with Alcon, the eye care division of Novartis, a multinational healthcare innovation company, to license the lens technology and take it through further testing, and to explore further applications of the technology. In addition to the glucose monitoring lens, Alcon and Google are now collaborating on developing lenses which would address weaknesses in vision, both measuring and correcting for the user's optical prescription. No doubt this is just the beginning: as the technology develops for these initial uses, it seems highly likely that further possibilities will arise. Given the capacity and expertise of the organisations involved, we can be confident that any viable opportunities will be vigorously pursued, and we can look forward to smart lenses, meeting a wide range of medical needs, coming to fruition over the next several years.